Pre-wash snow foam loosens and removes hard to shift grime. pH neutral so it does not wear down your wax, sealant or coating. Use through a foam lance or in a hand held pump sprayer. Gtechniq W4 Citrus Foam is a pH neutral pre-wash snow foam that loosens and removes hard to shift grime. Most traditional pre-wash snow foams come loaded with caustic chemicals that can degrade your sealant, coating or wax. Not W4 Citrus Foam! It's pH neutral formula is tough on road grime and bug splatter, but kind to your sealants, coatings or waxes. It is safe to use on all exterior surfaces including paint, glass, plastic trim, wheels, chrome, rubber and it is 100% biodegradable. You can use W4 Citrus foam through a foam lance or through a hand held pump sprayer. When applied, W4's citrus degreaser and strong foaming agent cling to the paint, loosening built up dirt and grime from your paint, making your wash process safer and more effective. 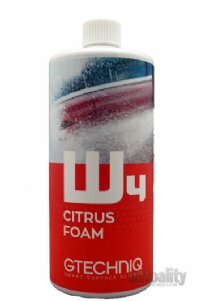 W4 Citrus Foam is highly concentrated. Through a foam lance you can dilute it up to 1:400 or up to 1:25 when used with a hand held pump sprayer. 1. Make sure to work out of direct sunlight. a. For light soiling in a foam lance, 1:400.
b. For heavy soiling in a foam lance, 1:200.
c. In a hand held pump sprayer, 1:20. 3. Spray foam onto your car and allow to dwell for 5 minutes then rinse thoroughly. 4. Do not allow the product to dry on the surface.